Setting the timing in Heinkel Cars and Scooters is pretty easy. 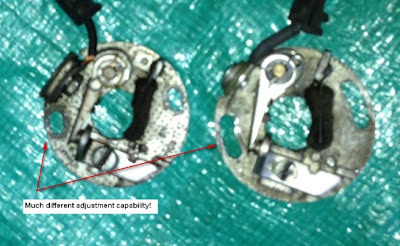 There are baseline marks for Top Dead Center ("TDC"), baseline ("slow"or "retarded") timing, and "advanced" timing molded right into the fan cover attached to the flywheel. You can set it and forget it or you can spend a little more time and try to optimize it. The basic static setting is 10 degrees before TDC on the model 407-a1 175cc scooter engines, and 8-10 degrees on the 200cc car engines. I had an interesting timing problem. I couldn't get my car to have timing less than 12 degrees. This meant I was getting early ignition, i.e. the spark was igniting before TDC and I was being robbed of power. It turns out that my problem was the points backing plate. I was using a base plate with much less adjusting capability. The plate on the right was the one that was in the engine. I added new points from the club, which never worked property, so I put that plate aside and substituted another plate with points I had around. As you can see by the holes, there's no way I could ever get to the level of adjustment that I needed. I took the easy route and elongated the slots in my current backing plate enough to get the timing I needed. Apparently some of these parts are different even though they look the same. I think I used points from a 175cc car in a 200cc engine, or vice versa. With the timing fixed and my break in period over, I'm driving around at speeds approaching 50 mph! There are different Baseplates, depending on whether your motor was originally equipped with Bosch or Siba Dynastart & Control Box. Each also has their own different CB Points set. It is possible to mix & match some of these items, they all basically do the same job, just minor differences between them. Biggest culprit for Ignition Timing woes is normally the Centrifugal Advance/Retard mechanism, very prone to rusting & seizing solid. Although engine will still run, you are then running on "fixed timing", with no automatic advance, which cripples vehicles performance. Highly recommend to check this component is working fully & correctly. These again have different types, Bosch or Siba!